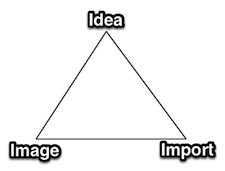 The Noetic Triune, Idea ↔ Image ↔ Import, is proposed as a new paradigm for the emerging worldview. It is one that represents all aspects of our existential reality; one that denotes its integral structure; one in which it is possible and permissible to conceive, contemplate, investigate–to know and explain–not only that which the orthodox worldview and spacetime paradigm allow but, also, that which proponents cannot or will not acknowledge, accept, or explain: immaterial, nonlocal mind and consciousness; meaning, spirituality, subjective experience; and a co-creative reality. The origin of this new thinking is found in the work of Dorothy Sayers, mystery writer, scholar, and lay theologian. In her book, The Mind of the Maker–subtitled God the creator as reflected in artistic imagination; and first published in 1941–Sayers offers an understanding of the sacred Christian trinity–Father, Son, Holy Ghost–through consideration of the artist, artistic creation, and works of art. Although she intended to offer a theological treatise on the Holy Trinity, what she has provided is a fecund foundation for a new paradigm for thinking about the integral structure and nature of reality. I content it’s a profound way of thinking fully and completely about the nature of physical and metaphysical reality; about source, manifestation, and meaning; about a way of thinking that resonates with spiritual and scientific thought, bridging the sacred and the secular. Here the source, the manifestation, and the meaning of reality are symbolized in the secular, noetic triune: Idea↔Image↔Import. Also contributing significantly to this new thinking and noetic triune is the work of systems philosopher, Ervin Laszlo. Guided by quantum science and drawing from the wisdom of ancient Vedantic thought, Laszlo presents a case for the existence of an immaterial field–the source and record of material reality–which he calls the Akashic field. In Science and the Akashic Field, he explains the origins and nature of this field and how it relates to the vacuum and zero point field (ZPF) of quantum science. He also introduces David Bohm’s construct, in-formation, an essential factor, a process–neither energy nor matter–which actually forms and governs that which is being in-formed. Here in the noetic triune, in-formation is represented by the symbol ↔. In other words, Idea ↔ Image ↔ Import is to be read, “Idea in-forms and is in-formed by Image which in-forms and is in-formed by Import.” This is the paradigm for the new thinking. The Akashic field and in-formation processes resonate with modern quantum science processes in which energy and matter materialize and de-materialize, i.e., pop in and out of existence; information and energy move back and forth between the Akashic field and spacetime. As physicist Lawrence Krauss asserts in A Universe From Nothing, quantum physics allows for wildly imaginary possibilities. Biologist Ruppert Sheldrake, in Morphic Resonance: The Nature of Formative Causation, explains his theory of morphic resonance, proposing a foundation of immaterial morphic fields which organize, structure, shape, i.e., in-form, biological morphology. Lynn MacTaggart devotes an entire book to exploring contemporary field theory and research in her popular book, The Field. But what of Idea↔Image↔Import? What are its three aspects in this mode of thinking? Import := significant cognitive, affective, and physiological meaning/value/ power of the Image in-formed in and in-forming us and others. The noetic triune, presented imperfectly, textually, as Idea↔Image↔Import, is better symbolized, graphically, as in Figure 1. In this paradigm, mind belongs to the realm of Idea; spacetime to the realm Image; and meaning and spirituality to the realm of Import. In the paradigm, ‘↔’ (or line) symbolizes the reciprocal, co-creative process (i.e., relationship) of in-forming. all are in-formed by Ideas in the plenum, the Akashic field. And all these reciprocally in-form and are in-formed, in their wholeness and interconnectedness, by other Ideas in the Akashic field. The Ideas of the field co-create mind–individual and collective–enabling us to know, think, feel, imagine, intend, share, and experience within and beyond the limits of spacetime and our physical senses. all in-formed, guided and inspired by, Ideas of field, by mind, individual and collective. It is the Image in which orthodox science limits, confines, imprisons itself. Import. Import is the individual and collective intellectual, emotional, physiological, and spiritual impact and effect of Idea and Image, in-forming and in-formed by brain, heart, body, and experience. For example, all experience–sensations, perceptions, and concepts; patterns, relationships, associations, values, and meanings; such cardinal emotions and feelings as awe, wonder, reverence, love, appreciation, joy, agony, and ecstasy; dispositions, fears, and attractions–all experiences belong to the realm of Import. Regardless of intent, the Import of Idea and Image is whatever thought, feeling, and action Idea and Image co-create–simply or complexly, subtly or overwhelmingly within us, individually and collectively.